Malaga … City by the Mediterranean sea. ‘Pescados y Mariscos’. Fish and seafood. It’s hardly surprising that you can enjoy countless fish dishes in almost every restaurant, but meat lovers can certainly eat well here too. The most famous fish in Málaga are probably the sardines and you will find them on the menus of the restaurants in the city, but they are mostly sold at the ‘chiringuitos’ on the beach. Expertly roasted on long, wooden spits, they are in great demand among residents and visitors alike. While you’re at it, you should also try the ‘pescaíto frito’ (small fried fish). This region is known for its predominantly sweet Málaga wines. These are traditional, fortified wines of the muscatel and Pedro Ximénez grape varieties. Both grape varieties are white and the colour of the wines range from light yellow to an intense dark brown. Once harvested, the grapes are slightly sun-dried on mats before being pressed. This way, moisture is extracted from the grape, which gives the wine a more concentrated, sweeter taste. During fermentation, a reinforcing alcohol is added so that the final wine obtains a higher alcohol content. Below you’ll find a few popular varieties. The first three are used both as an aperitif and as dessert wine. The last two drier varieties are suitable as an aperitif. Málaga Dulce. Sweet and dark in colour. Moscatel. Sweet and amber coloured. Pedro Ximinez. (PX) Sweet and brown coloured. Parajete. Drier than the previous three and brown coloured. Añejo Seco. Dry and golden yellow in colour. Hours: Tuesday to Saturday: 1.30 pm to 4.30 pm and 9 pm to midnight. 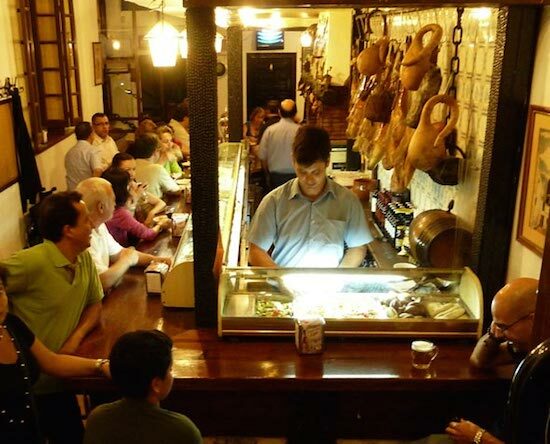 Hardly any information can be found about this tiny, classic restaurant in the centre of Málaga, but people who have eaten here, rave about this authentically Spanish establishment, where the specialty is an excellently prepared piece of meat. They also serve one of the best gin and tonics in the city. The staff is friendly and very professional. You might have to pay a few euros more than you would in other establishments, but you will not regret it. Hours: daily from midday to midnight. Friday and Saturday until 1 am. Delicious food in a cosy restaurant in the heart of the historic centre. The restaurant has a terrace at the front. The interior is light and delightfully Spanish. 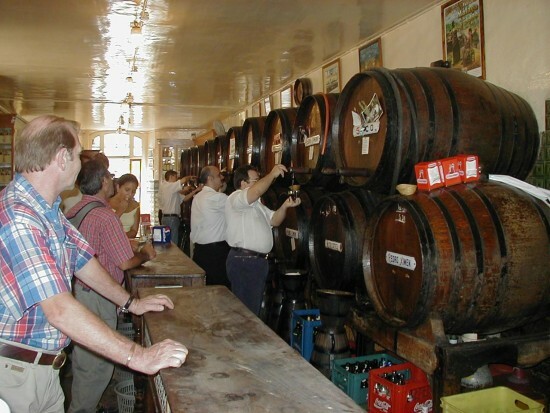 Casks filled with Málaga wines are lined up behind the bar. Bodega el Patio is perfect for typically Spanish rice dishes, a large selection of tapas, salads, meat and fish. Hours: Monday to Sunday 11 am to 1 am. An atmospheric tapas/beer pub in the heart of the city. You can eat both indoors or outside. It is usually pretty busy and the servings are generous. A lively Spanish look and feel combined with a great atmosphere make ‘Los Gatos’ a popular spot to go to have a drink or a full meal. It is also very popular among locals. Open daily from 11 am to 2 am. Touristy and crowded? You bet, but you still shouldn’t miss it. You won’t believe your eyes. El Pimpi is a famous and cosy bar in the centre of Málaga. 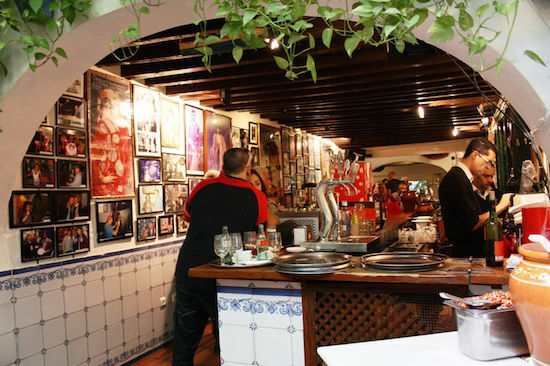 The Spanish interior decoration consists of photos of the celebrities who visited El Pimpi, as well as pictures of the feria and bullfighting. The huge wine barrels are signed by famous people, for example Paloma Picasso, Antonio Banderas, the Duke of Alba and Rafael Nadal. The blue flowerpots on the walls and the many plants give you the feeling that you have stepped into an Andalusian courtyard. In the restaurant area, the wooden wine barrels are stacked between the tables and you can also enjoy a tapa at the bar. The restaurant also has a terrace. El Pimpi has now opened a second establishment. ’El Pimpi Marinero’ can be found at the terrace side of the original El Pimpi. This restaurant specialises in seafood. Furthermore, they serve excellent cocktails. 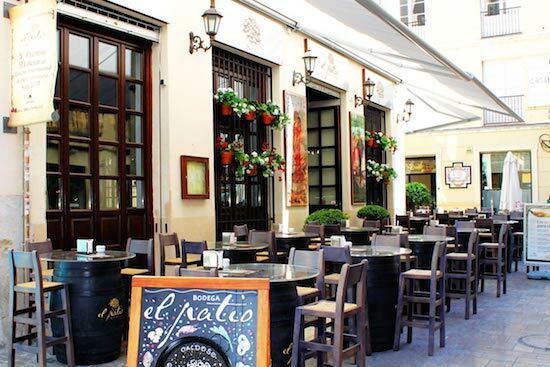 This well-known wine bar is the oldest tavern in Málaga and the perfect place to try out the famous Málaga wines. The establishment really only consists of a long bar with wooden barrels behind it as a backdrop for the staff. You can grab a bite to eat, but people really come here for the wine and a friendly chat. The Malaga wines that you can try here are from the eponymous Bodega Antigua Guardia, located in the Montes de Málaga, a national park North of the city. The name of the wine is indicated on the barrel. The bartender writes down what you’ve been drinking on the bar with chalk. Next to the ‘Cervantes’ municipal theatre, in the historic centre, you will find the modern restaurant of the Dutch Hélène. On the terrace you can experience the cosy atmosphere of the typical Spanish square. The menu consists of pastas, salads, tapas and various exotic and vegetarian dishes. Apart from the creative kitchen, Vino Mio is also known for its flamenco shows. Artists perform here nightly from 8 pm to 9.30 pm. Hours: 1 pm to 4.30 pm and 7.30 pm to 0.30 am. Closed on Mondays. Small, cosy, bustling and right in the centre. A bunch of chalkboards hang inside, scribbled with the most varied dishes, menus and tasty tapas. Comfortable atmosphere, fun service and excellent quality. 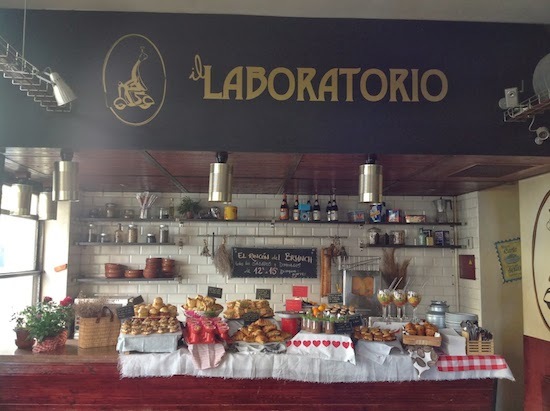 The restaurant is hugely popular with tourists, but also with the Malagueños themselves and it is practically always busy. The ‘terrace’ located right on the street only has room for two tables! A second restaurant was opened just around the corner that is much more spacious: El Meson de Cervantes (Calle Alamos 11). Both restaurants have the same dishes on the menu. Hours: Midday to 4.30 pm and 8 pm to midnight. This noisy and simple outdoor restaurant is definitely something else. The city bus will take you to the old fishing district of El Palo in under fifteen minutes. 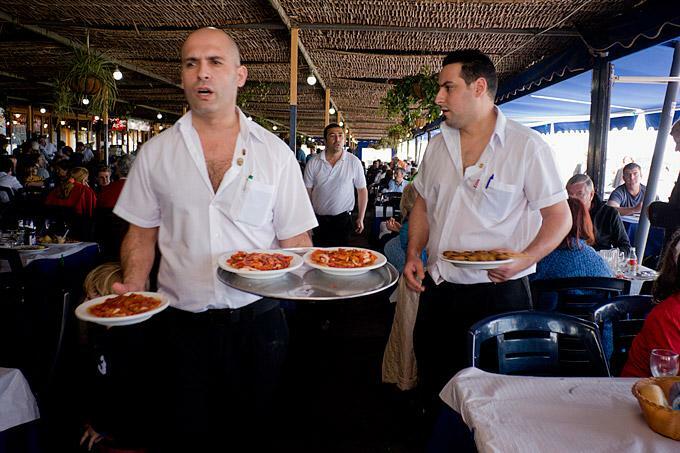 ‘El Tintero’ is a seafood restaurant by the beach where the waiters walk around with well filled dishes. They call out what they are serving as they walk alongside the tables. If it appeals, all you have to do is raise your hand and the plate is yours. They also serve paellas, meat- and chicken dishes here. El Tintero is an especially good place to eat with a group. You can easily share what is placed in front of you. The plates stay on the table and at the end of the meal, everything is added up by counting the plates and bottles at your table. Prices range from € 7.50 to € 10 per dish. Hours: daily from 4 pm. Closed on Tuesdays. 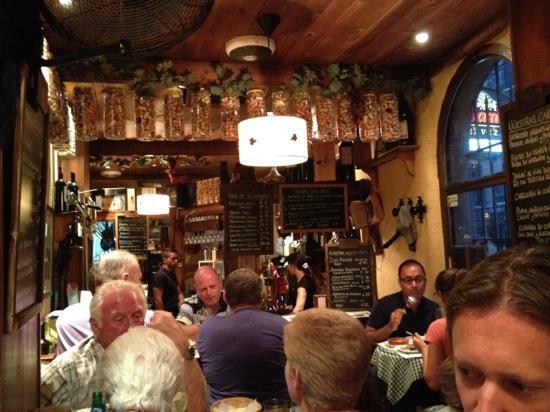 Aside from tapas, this very Spanish, simple and small restaurant also serves several sandwiches, fish- and meat dishes. According to Spanish custom, used napkins are scattered all over the floor, a sure indicator of good food. There isn’t much space at the bar, but that’s exactly what makes this place so irresistible. You can sit at tables on the first floor and outside on the terrace. Hours: daily from 11 am to midnight. Sundays until 5 pm. 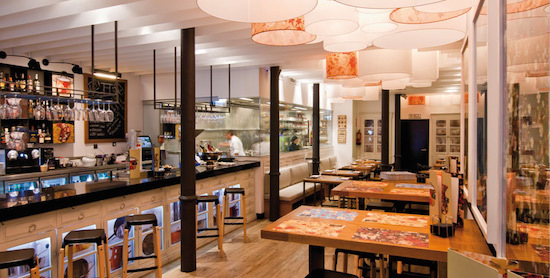 This trendy, modern restaurant with a cocktail bar has an Andalusian menu and you can see from your table how the dishes are prepared in the kitchen. While it’s slightly more expensive than most other restaurants, you certainly get your money’s worth. The appearance is phenomenal, the service is both friendly and polite and the tapas and seafood dishes are heavenly. Hours: Monday to Sunday midday to midnight. You can enjoy an extensive menu either inside or outside on the spacious terrace at this trendy Italian restaurant. Pizzas, pastas, salads and Italian style tapas… it has it all. The restaurant also has a large selection of beers. Hours: Monday to Friday 8.30 am to midnight. 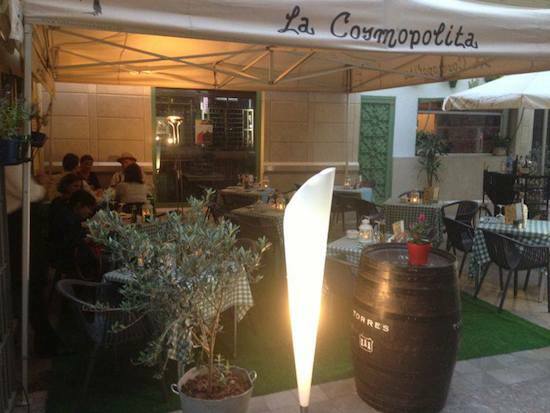 This cosy restaurant with a large bar and terrace can be found near the cathedral. The menu is contemporary, yet traditional. 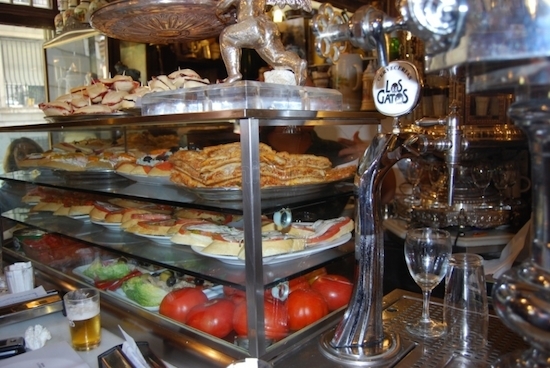 The tapas are often presented in an original way. Highly recommended.